England’s Test debutant Ben Foakes enjoyed a champagne day on the second day of the first Test against Sri Lanka at Galle, completing a century on Test debut and taking two catches and a stumping. Jack Leach could only add a single to his overnight score of 14 as he fell caught Dhananjaya de Silva bowled Dilruwan Perera, the bowler completing his five-for with that wicket. With the last man Jimmy Anderson at the crease, Foakes moved quickly to secure his century on Test debut, his 100 coming off 200 balls with a punch off the back foot past the bowler. He fell two balls later, having added his 10th four of the innings the previous delivery, De Silva completing his third catch of the innings, this time off the bowling of Suranga Lakmal (3-73). Foakes became only the second England wicketkeeper-batsman to score a century on Test debut and he was also the only England batsman to pass 50 in the innings, as England were all out for 342 off 97 overs, with Perera returning figures of 5-75. Rangana Herath took one wicket in the innings to take his career Test wickets tally to 431 in what has been announced as his final Test match. Herath has drawn level with legendary New Zealand opener Sir Richard Hadlee and will need to take three wickets in England’s second innings just to draw level with Indian legend Kapil Dev, who retired in 1994 with 434 Test wickets. 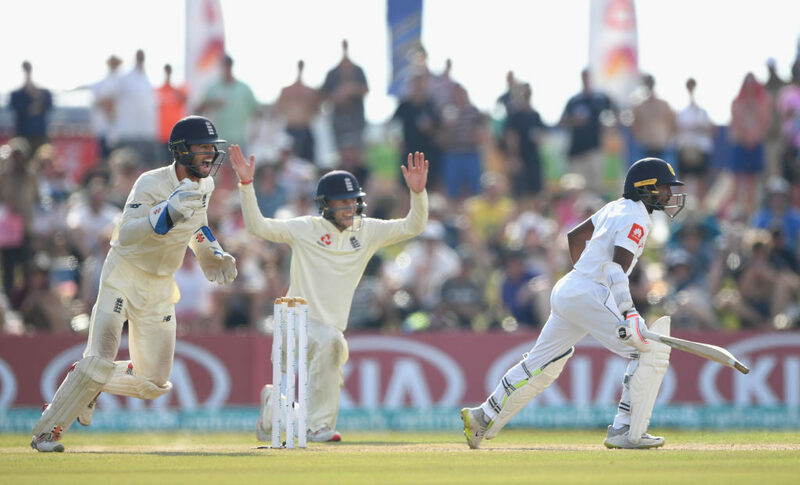 When Sri Lanka took the crease, Foakes found himself immediately in the action behind the stumps, taking his first Test catch off the second ball of the innings, after Dimuth Karunaratne had hit the first ball from off Anderson for four. Karunaratne swung hard at the second delivery of the innings and England went up for the catch as Foakes took the ball securely in his gloves! 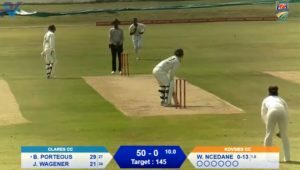 Karunaratne reviewed the decision but was given out owing to a visible spike that registered on UltraEdge. Foakes’ Surrey teammate Sam Curran then trapped Kaushal Silva leg before for a six-ball single to reduce Sri Lanka to 10-2 in the fourth over. Angelo Mathews (52 off 122 balls) and skipper Dinesh Chandimal (33 off 72 balls) righted the innings with a fifth-wicket stand of 75, with Niroshan Dickwella (28 off 39 balls) and Dilruwan Perera (21 off 49 balls) doing their best to raise the Sri Lankan total. A last-wicket stand of 28 between Lakmal (15 off 20) and Herath (14 off 16) took Sri Lanka over the 200-run mark off 68 overs, Adil Rashid dismissing Lakmal to end the innings and claim his second wicket (2-30). Moeen Ali was the star turn with the ball, taking 4-66 off 21 overs, including the prized wickets of De Silva and Mathews, while Leach (playing in only his second Test) returned his best Test figures in an innings to date (2-41). Foakes capped off a fine personal day by taking two catches as well as securing his first Test stumping to remove Chandimal off Rashid. England reached the close on 38 without loss to take a 177-run lead into the third day with 10 wickets in hand. Debutant Rory Burns will start fresh tomorrow on 11, with his eye set perhaps on also completing a century on Test debut). Alongside Burns is Keaton Jennings on 26, the latter no doubt eager to break his 19-innings trot of not passing 5o in a Test inning during the morning session tomorrow.